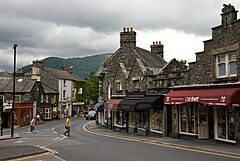 Ambleside is administered by South Lakeland District Council and forms part of the Lakes civil parish but from 1894 to 1935 it was a separate urban district council. ‘Steamers’ (in reality diesel-powered ferries) run to Bowness-on-Windermere and Lakeside offering fine views of the lake and surrounding mountains. Ambleside is a base for hiking, mountaineering and mountain biking. It has a number of hotels, guest houses, pubs and restaurants as well as shops. In particular, there are a number of shops selling equipment for walkers and climbers in the town. Ambleside is also home to the headquarters of Brathay Exploration Group, a youth charity based just beyond Clappersgate on the road to Hawkshead. The album CSI:Ambleside, by Birkenhead-based band Half Man Half Biscuit, is named after the town. Ambleside features an oceanic climate, but being within the Lake District it does experience higher annual rainfall than the average for the North-West of England. Parts of the town have been flooded on numerous occasions, with the River Rothay breaking its banks during Storm Desmond in December 2015. The town's name is derived from the Old Norse "Á-mel-sǽtr" which literally translates as "river – sandbank – summer pasture". To the south of Ambleside is the Roman fort of Galava, dating from AD 79. In 1650 the town was granted a charter to hold a market. In the reign of James II, another charter was granted for the town to collect tolls. The town's Market Place became the commercial centre for agriculture and the wool trade. The old packhorse trail between Ambleside and Grasmere was the main route between the two towns before the new turnpike road was completed in 1770. Smithy Brow at the end of the trail was where pack ponies were re-shod after their journey. With the coming of the turnpikes, the packhorse trains were superseded by horse-drawn stagecoaches, which regularly travelled between Keswick and Kendal via Ambleside. William Wordsworth worked in Ambleside, as Distributor of Stamps for Westmorland, from 1813, while living at Rydal Mount in the nearby village of Rydal. This government position induced Shelley to write a sonnet of mild reprimand, To Wordsworth, but it gave Wordsworth the financial security to pursue his poetry. In 1842, he became the Poet Laureate and resigned his office as Stamp Distributor. Ambleside & District Golf Club was founded in 1903 (the club disappeared in the late 1950s.). The Armitt Library and Museum, which provides a source of local history with a collection which represents many local artists and writers, was opened in 1912 in memory of Sophia and Mary Louisa Armitt. The German artist Kurt Schwitters lived in Ambleside for two years until his death in 1947. He had been interned in the Isle of Man during World War II after moving to England to escape the Nazis. The railway engineer Edward Bury and his wife Priscilla Susan Bury lived at Ambleside. The building was depicted by the Victorian landscapist Lewis Pinhorn Wood (1848-1918) in his late 19th century work The Cobbler's Shop on the Bridge. The Ambleside campus of the University of Cumbria, formerly St. Martin's College and Charlotte Mason College, is at the northern end of the town; courses held at the campus include Conservation, Forestry, and Outdoor Studies. On 1 December 2009, it was announced that the Ambleside campus would be 'mothballed' at the end of July 2010, and would no longer take new undergraduate students. The closure was in the face of fierce opposition from the Ambleside students, the townspeople, and support pledged from Tim Farron, MP for the campus and its students. In July 2011, the university announced a plan to reopen the campus and increase student numbers at the Ambleside campus beginning in 2014. In September 2014, the newly refurbished campus was reopened to welcome students on courses ideally situated in this setting in the heart of the Lake District. A shared Church of England and Methodist church. Before the 17th century the dead of Ambleside were buried at St Martin's Church, Bowness-on-Windermere, Ambleside then gained the right to its own registers and had a chapel dedicated to St Anne. This was too small to accommodate the enlarged Anglican congregations as tourism developed following the opening of the Kendal and Windermere Railway in 1847. St Mary's Church was built in the 1850s to a design by George Gilbert Scott in the Gothic Revival style. Notable features include its stone spire, an unusual feature in Westmorland churches, which makes the church the tallest building in the town. 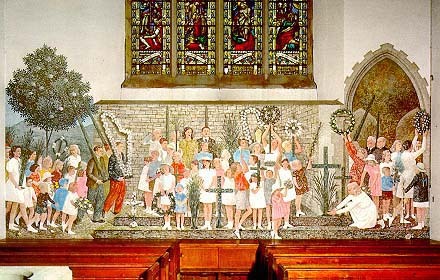 There is a mural depicting rushbearing (a ceremony which is held on the first Saturday in July). The mural was created during the Second World War when the Royal College of Art was based in Ambleside. The vicar of Ambleside, Henry Adamson Thompson, is depicted on the right hand side of the mural. Both he and his only son, Henry Lionel Francess Thompson — who was killed in WW2 — are buried in close proximity to each other in the church's cemetery. Other notable burials are Annie, Sophia and Mary Louisa Armitt. The Catholic Church of Mater Amabilis is on Wansfell Road, part of the Ambleside one-way system. Until September 2013 it was part of the Combined Parish of Ambleside and Grasmere; but upon the retirement of Rev Fr David Duanne (the Parish Priest) it joined with the Parish of St Herbert's Windermere, with the parish priest Rev Fr Kevan Dorgan of Windermere moving into the adjoining house in Ambleside and services in Grasmere discontinuing. Ambleside has many pubs for its size: there are some ten pubs and bars within a quarter-mile radius. They are supported by the tourist industry, so essential to the town, as well as the student population associated with the University of Cumbria. The town maintains one of the busiest volunteer mountain rescue teams in Great Britain: The Langdale & Ambleside MRT. ^ "Ambleside climate information". Met Office. http://www.metoffice.gov.uk/public/weather/climate/gctvssktt. Retrieved 25 October 2015. ^ "History of Ambleside". Golakes. http://www.golakes.co.uk/places/towns/ambleside-history.aspx. Retrieved 24 June 2010. ^ “Ambleside & District Golf Club”, “Golf’s Missing Links”. ^ Bridge House – Information from a notice at Bridge House. ^ "Name: BRIDGE HOUSE List entry Number: 1245148". English Heritage. http://list.english-heritage.org.uk/resultsingle.aspx?uid=1245148. Retrieved 23 July 2014. ^ "Facebook Petition Group". https://www.facebook.com/groups/11471427570/. ^ "MP recruits new students in fight to save Ambleside campus". 22 September 2008. http://timfarron.co.uk/en/article/2008/105306/mp-recruits-new-students-in-fight-to-save-ambleside-campus. ^ "MP takes Ambleside campaign to Westminster". 10 November 2008. http://timfarron.co.uk/en/article/2008/105366/mp-takes-ambleside-campaign-to-westminster. ^ "MP asks new Vice Chancellor of University Cumbria to scrap plans to downgrade Ambleside campus". 18 March 2009. http://timfarron.co.uk/en/article/2009/105458/mp-asks-new-vice-chancellor-of-university-cumbria-to-scrap-plans-to-downgrade-ambleside-campus. ^ Eve, Kelly (28 September 2011). "Cumbria university plan to reopen mothballed Ambleside campus". News and Star. http://www.newsandstar.co.uk/news/cumbria-university-plan-to-reopen-mothballed-ambleside-campus-1.882212. ^ Bingham, Roger (2011). "Guide book reveals". Westmorland Gazette. http://www.thewestmorlandgazette.co.uk/nostalgia/8834619.Guide_book_reveals_man_made_gems/. Retrieved 16 March 2014. ^ "Church of St Mary". English Heritage. http://list.english-heritage.org.uk/resultsingle.aspx?uid=1244784. Retrieved 17 March 2014. ^ Leslie Duxbury (2008), Bohemians in Exile: The Royal College of Art in Ambleside, 1940-1945. "Bohemians in Exile" was also the title of a 2011 exhibition at the Armitt Museum. Wikivoyage has a travel guide for Ambleside. Ambleside Photographs On the Ambleside, Cumbria website. The Windermere Way – a walking route that goes right around the lake. This page uses content from the English language Wikipedia. The original content was at Ambleside. The list of authors can be seen in the page history. As with this Familypedia wiki, the content of Wikipedia is available under the Creative Commons License.